Sumptuous, decadent, and somehow quite affordable . Notes: This Barbados Plantation Rum blend of extra old vintages that were blended to commemorate the 20th anniversary of Alexandre Gabriel joint Pierre Ferrand. The vintage rums themselves were produced using long fermentations and both copper pot and column still distillations. Aged for many years in Barbados in its hot and humid climate, and although we don’t know what casks they used, some were probably bourbon casks – since the market is always flooded with these low cost option barrels (but very flavorful casks – the price is cheap because there are so many on the market not necessarily a reflection of quality or lack thereof) among a few other types. These stocks of vintage rum were at some point when they were ready for market bought up by Cognac Ferrand shipped to Cognac Ferrand’s Château de Bonbonnet at their natural strength in order to preserve their richness of aroma and flavor ( not to mention to save space). Appearance: Aged mahogany, a delightful red gold.On swirling it leaves a thick oily coat on the glass which then starts to very slowly develop legs that descend ever so slowly back down to the pool of rum in the glass. Drinks: Enjoyed on its own, it also does well in simpler rum drinks.As it is rather delicate, if you must mix it, please don’t bury it under too many ingredients and let it shine through. Bottle: 1st Bottling; Flattened tear drop shape decanter with heavy base (similar to The Paradis, Louis XVI, and other obscenely expensive cognacs) Gold script with a lazer etched scene/diorama on either side of the seal on the front of the bottle gold neck with concave crown, gold colored top with cork closure. A magnificent package for an even finer rum. Nicely done overall, lovely to look at. Impressive as a gift package. 2nd Bottling; (No difference in taste, just change of package)Heavy glass Decanter of clear,almost sparkling glass, roughly cylindrical in shape. 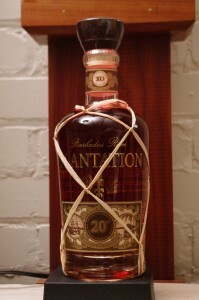 Heavy glass decanter bottom, Gold lettering and a parchment almost currency grade label with matching printing quality with a discrete sisal netting.Paper ribbon label is below a ribbed neck topped with a cork sporting a large wooden stopper with an inset stamp/seal at the center of the stopper. Altogether an elegant package that stands out and conveys a sense of luxury and taste. A wonderful thing to give or receive. Cigars: Romeo and Julietta or similar shade grown or natural wrapper so as to not intrude on the delicacy of this rum. 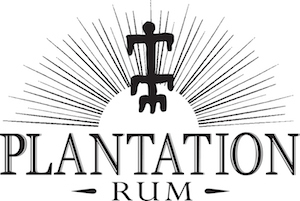 Other: While not in the usual style of the Plantation rum blends this is a complex and worthy rum. Final Thoughts: An amazingly flavorful and well balanced rum for an even more amazing price given the quality and age. Rum proves to be the most affordable luxury spirit once again. A nicely done and easy to navigate website, that while not flashy ( thankfully in my mind) has a lot of information about all their offerings – Liqueurs, gins, and cognacs among other offerings, all of which we have found to be delightful. 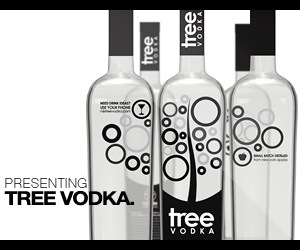 Rarely do you find such a consistently great portfolio of spirits!